This photo shows the view to the east from Paranal Observatory, seconds after the Sun has disappeared behind the horizon. 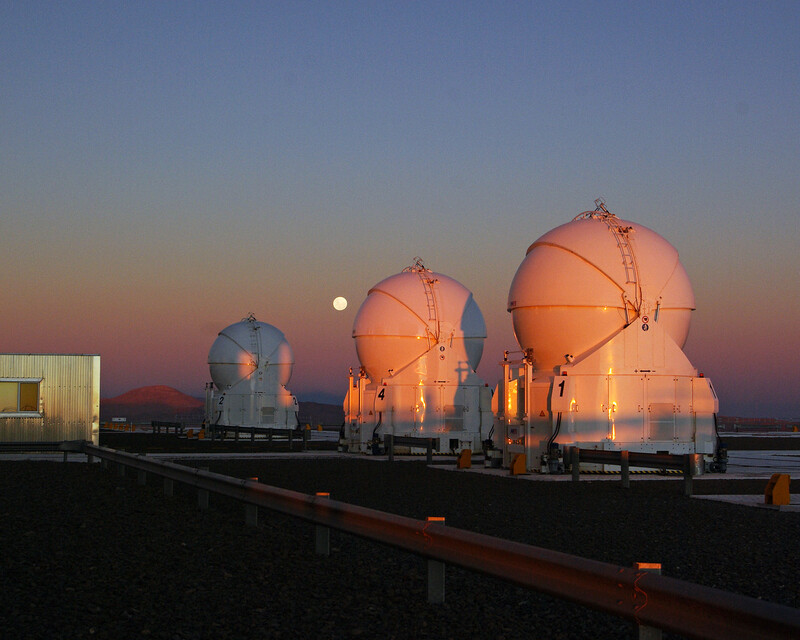 The orange glow of the sunset can be seen against the 1.8-metre VLT Auxiliary Telescopes, and the almost full Moon is hanging in the sky. But the image is more interesting still, thanks to an atmospheric phenomenon known as the Belt of Venus. The grey-bluish shadow above the horizon is the shadow of the Earth, and right above it is a pinkish glow. This phenomenon is produced by the reddened light of the setting Sun being backscattered by the Earth's atmosphere. As well as right after sunset, this atmospheric effect can also be seen shortly before sunrise. A very similar effect can also be observed during a total solar eclipse. 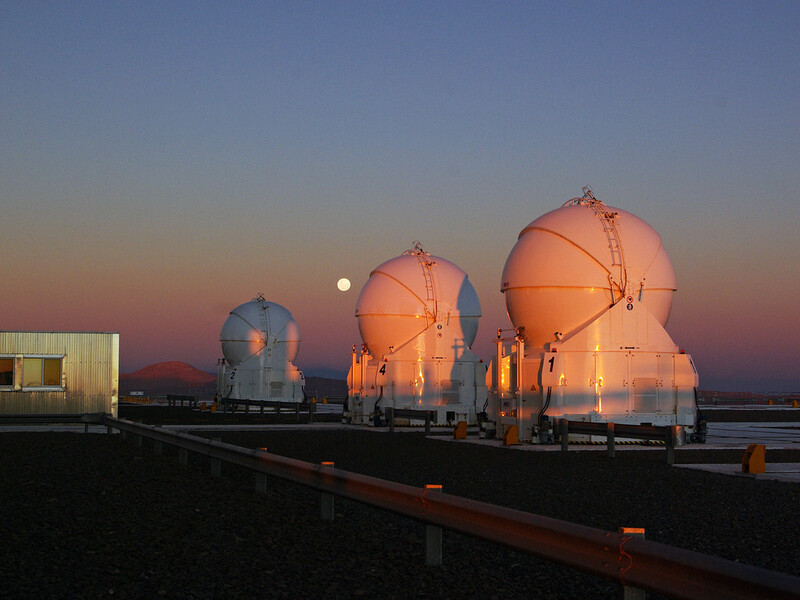 The telescopes shown in the image are three of the four 1.8-metre Auxiliary Telescopes, housed in ultra-compact mobile enclosures. 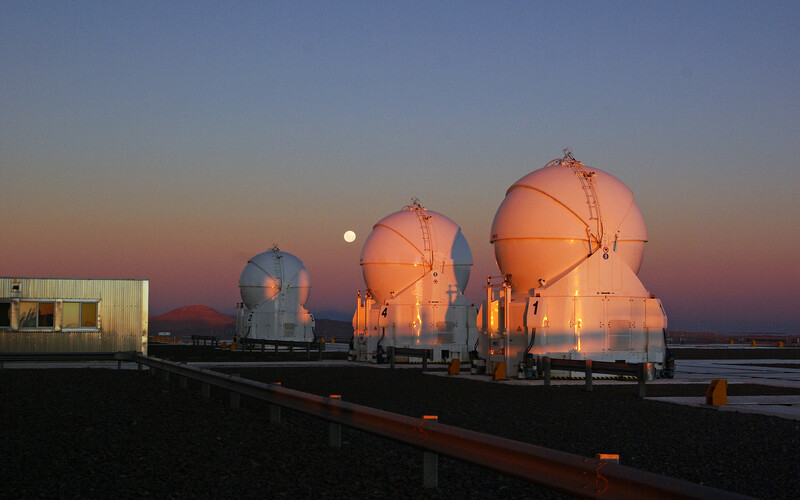 These telescopes are dedicated to interferometric observations, when two or more telescopes work together, forming a virtual mirror and thus allowing astronomers to see much finer details than can be seen with the individual telescopes working independently. Carolin Liefke took this photo during a visit to Paranal, and submitted it to the Your ESO Pictures Flickr group. The Flickr group is regularly reviewed and the best photos are selected to be featured in our popular Picture of the Week series, or in our gallery. Carolin works at the Haus der Astronomie (House of Astronomy) centre for astronomy education and outreach in Heidelberg, Germany, and is a member of the ESO Science Outreach Network (ESON). ESON brings ESO news to Member States and other countries by translating press releases and providing a point of contact for local media.